I have always been active in sports, so following a 1988 a construction accident that left me paralyzed from the waist down, wheelchair sports have become a lifestyle. Over the years, I have tried all the wheelchair sports, and currently still compete on a basketball team in Tucson. 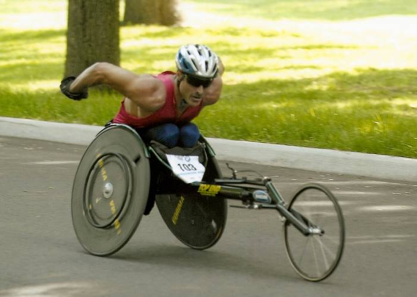 It is Wheelchair Road Racing that has driven me the past 11 years, competing in more than 100 events, including 50+ marathons. Looking forward to each race as it approaches is one motivating factor for training 14-20 miles, six days each week. I truly have a passion for wheelchair road racing and hope to bring as much awareness as possible each and every day! That awareness attracts wheelchair-users of all ages also. During the marathon in Knoxville TN, I was overwhelmed and moved by the participation of two elementary-aged boys in a 10-K race. Their smiles from ear to ear warmed my heart and challenged me even further to race for support, research and a cure!